Abstract: This talk will walk through the process and platforms involved in getting AI algorithms into production. We will also examine how to make AI more automated in your company process. In summary, you will gain an understanding of the AI process, platform choices, and options for optimizing your key metrics. Bio: Aarthi enjoys building dynamic teams to launch scalable products. She brings over 15+ years of combined experience in product management, consulting and engineering. Currently she leads the personalization team at Target to create unique customer experiences powered by machine learning algorithms. She enables her teams to embrace the power of customer research & product analytics to create a product strategy that drives positive business results. 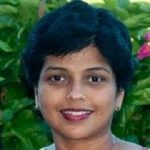 Aarthi’s experience in Financial technology encompassed the launch of award winning Social Security and Income Planning solutions that saved billions of dollars for retirees. She has also worked at Intuit, Oracle and JP Morgan in her earlier years. On the academic front, she holds an MBA from Wharton, MS in Computer Science from Stony Brook University and BS from Madras University.